(Nanowerk Spotlight) Back in the 1970s, Arthur Ashkin of Bell Laboratories found that radiation pressure – the ability of light to exert pressure to move small objects – could be harnessed to constrain small particles (see the original 1970 paper: "Acceleration and Trapping of Particles by Radiation Pressure"). This discovery has since formed the basis for the development of optical tweezers, a tool frequently used to control the motion of small biological objects and investigate them. Optical tweezers offer researchers the chance to perform precise force sensing in a fluid environment. This could help to give clarity to some of the picoNewton (10-12 N) forces that govern fundamental processes in the cell. However, currently the use of tweezers to probe biological, samples requires either direct irradiation with a laser, or the use of a tool or proxy to exert or sense very small forces. There are many instances when exposing samples to high intensity laser light is less than ideal – typically this is within a biological context, such as interacting with mammalian cells. Most research groups currently irradiate the cells and are forced to use low powers and correct for optical distortions caused by the sample. In this instance, it is favorable to use tools to exert the small forces of the laser traps indirectly – however, this leads to the problem of how do you make the microscopic tools? The creation of microtools requires further specialized techniques that are very costly, such as focused ion beam lithography or two-photon techniques. Synthetic microtools production techniques also results in very low numbers of probes within the sample. "Despite being built around a fundamental concept over 25 years old, the uptake of optical tweezers has been much slower than equivalent nano-techniques such as scanning probe microscopy," Dr. Dave Carberry, a lecturer at the School of Mathematics and Physics, University of Queensland, tells Nanowerk. "We now have shown that optical tweezers can be combined with naturally derived algae to create a stable nanoscale optical force sensor. We hope that this may enable other groups to utilize this technique to probe key force interactions that occur at the lowest end of the nanoscale force regime." Reporting their work in the October 24, 2012 online edition of Nano Letters ("Measuring Nanoscale Forces with Living Probes"), a team at the University of Bristol has now demonstrated the manipulation, calibration, utilization, and functionalization of a biologically derived, living, nonspherical optical trapping probe. This work was a collaborative effort that also included Prof. Stephen Mann and Dr Avinash Patil from the Chemistry Department at the University of Bristol. "Using algae offers an interesting alternative as they are easy to culture, clonal – so that once you have identified a useful shape you can grow millions of replicates – and are a surprisingly effective force probe," explains Sam Olof, a postgraduate researchers at the Bristol Centre for Functional Nanomaterials, and first author of the paper. "While more complex to calibrate than a simple microsphere, the advantages of removing the laser focus from the sample and the exertion and measurement of sub-picoNewton scale forces greatly outweigh this challenge." For their experiments, the team worked with living cells of the freshwater diatom, Nitzschia subacicularis. Diatoms – unicellular algae – not only are easy to cultivate in large numbers, they also show a high morphological diversity among different diatom species. This opens up the possibility of matching selective features of the biomineralized form to appropriate technological functions. In essence, it will be possible to use a type of freshwater algae as a simple living probe that can be grown to purpose. 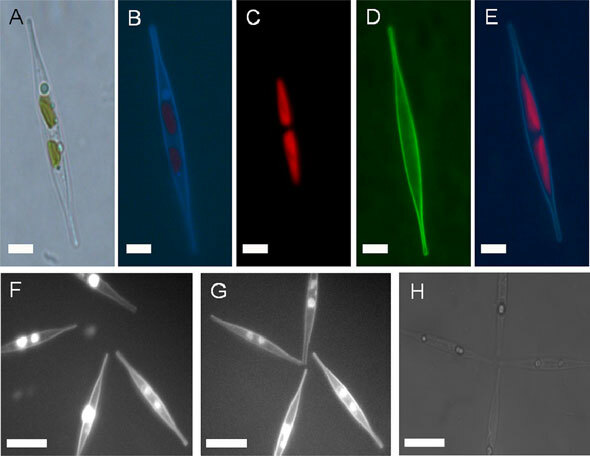 Olof notes that, in parallel experiments, the team demonstrated that the organic coatings and additional extracellular polymeric substances on the surface of the N. subacicularis diatom frustule could be used to anchor a variety of inorganic, organic, and biological functional species onto the probe surface. "The ease of surface modification by chemically tethering a range of functional molecules to the polysaccharide outer layer of the diatom frustule further extends the application of diatoms as living probes," he says. "Indeed, it should be possible to design a range of functional probes based on diatom surface chemistries that could find use in diverse nanobiotechnological applications." This work has been the result of a collaborative team effort by researchers with a diverse background and expertise in chemistry, physics and biology. The physics group is strongly interested in developing further microtools and applying them to different experiments. Recent publications (see for instance their recent reports "Force sensing with a shaped dielectric micro-tool" and "Surface imaging using holographic optical tweezers" that show further examples of the tool development objectives. The chemistry research group is interested in other bio-inspired and bio-hybrid systems such as liquid proteins, chemically derived cell mimics and control of crystal formation. Recent publications include "Polymer/nucleotide droplets as bio-inspired functional micro-compartments " and "Cytoskeletal-like Supramolecular Assembly and Nanoparticle-Based Motors in a Model Protocell"
While the biology team focus on various aspects of the structure and function of freshwater ecosystems with a particular focus on the use of benthic diatoms as indicators of ecological status in both rivers and lakes (see for instance: "Controls on the autochthonous production and respiration of organic matter in cryoconite holes on High Arctic glaciers").